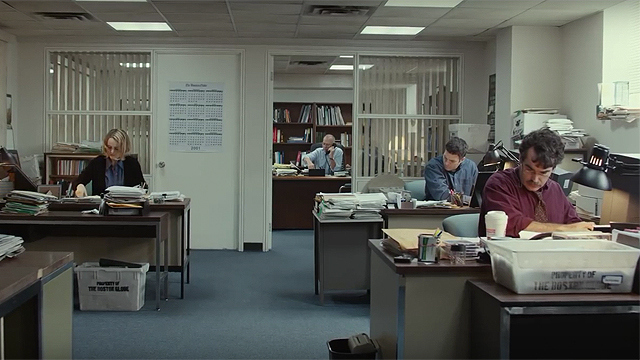 Tom McCarthy’s SPOTLIGHT is everything that James Vanderbilt’s Rathergate drama TRUTH wanted to be – a vital journalism procedural that actually has the facts to back up its case. The film focuses on the 2002 Pulitzer Prize-winning investigation by the Boston Globe’s “Spotlight” team into the scandal of child molestation and systematic cover-up within the Catholic Church. The investigation is spearheaded by editor Martin Baron (Liev Schreiber), who has just joined the paper after a buyout. 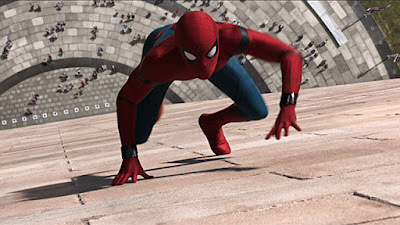 Baron tasks the team – made up of editor Walter “Robby” Robinson (Michael Keaton), and reporters Mike Rezendes (Mark Ruffalo), Sacha Pfeiffer (Rachel McAdams) and Matt Carroll (Brian d’Arcy James) – to dig into the case against Father John Geoghan, a Catholic priest charged with sexual abuse of over 80 children. The staff reports to assistant managing editor Ben Bradlee Jr., son of legendary Washington Post editor Ben Bradlee of Watergate fame (see ALL THE PRESIDENT’S MEN) sharply played by John Slattery of Mad Men fame. To prove that Cardinal Law found out about Geoghan 15 years earlier and did nothing, the Globe sues the church to obtain access to incriminating documents, something that may alienate the paper’s readership, 53% of which are Catholic. With the help of lawyers Mitchell Garabedian (Stanley Tucci), and Eric MacLeish (Billy Crudup), it doesn’t take long for the team to uncover that close to 90 priests in the Boston area have been accused of sexual misconduct. McCarthy certainly atones for his previous film, the atrocious Adam Sandler vehicle THE COBBLER, with his passionately meticulous work here. The camerawork, shot by cinematographer Masanobu Takayanagi, is straightforward as is the editing, as no flashiness is required to enhance the swift, compelling storytelling on display. Many films have great casts, but SPOTLIGHT is my vote for best ensemble of 2015. Keaton, who was wrongly passed over by the academy for his performance in BIRDMAN last year, could be back in the Oscar race for his stellar turn here. Ruffalo, whose reaction to the enormity of the scandal is the most emotional, also stands out, and McAdams puts in her second solid performance of the year (SOUTHPAW was the first one). Schreiber, Slattery, James, Tucci, and Crudup crush it as well – man, this film is really a boy’s club! – and a few non-names such as Neal Huff and Michael Cyril Creighton shine in roles as outspoken victims. I bet that, much like its classic newspaper drama predecessors ALL THE PRESIDENT’S MEN and ZODIAC, this is a film that will reward repeat viewings. Its pace and construction is tightly wound, but still takes time for some interesting moments in-between the unveiling of events – i.e. a shot of Scrieber looking for the publisher’s office, a beautifully framed shot of Ruffalo, James, and McAdams working at their desks with Keaton in his office behind them (see above). SPOTLIGHT will definitely make my top 10 films of 2015 list, and I’ll be pulling for it come Oscar time. The acting, screenplay, editing, direction, Howard Shore’s stirring score, etc. should all be acknowledged in the upcoming awards season. More importantly, it should be seen. It has a lot of competition and isn’t playing on a huge amount of screens so folks should really seek it out. Too many great films slip through the cracks and are largely overlooked. Don’t let that happen to the brilliant, intelligent, and über insightful SPOTLIGHT.